I get burnt out on birthday cookies. My lazy little brain wants to just write out 'Happy Birthday!' on each cookie and call it a day. But then I get to thinking about someone opening a box of cookies only to see something they have seen all too often before it.. well… it motivates me to try new things. Not totally fantastic or brilliant or earth shattering new things… just techniques and designs that are new to me. 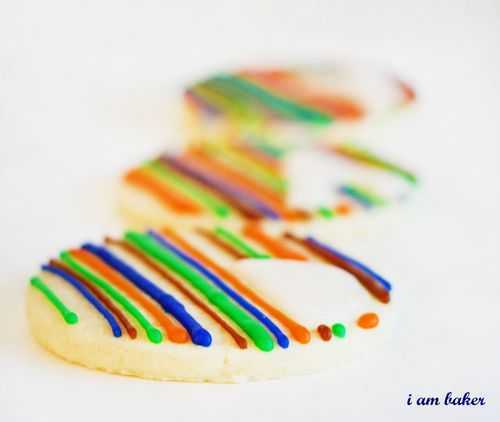 These fantastically un-original cookies are just different colored lines. 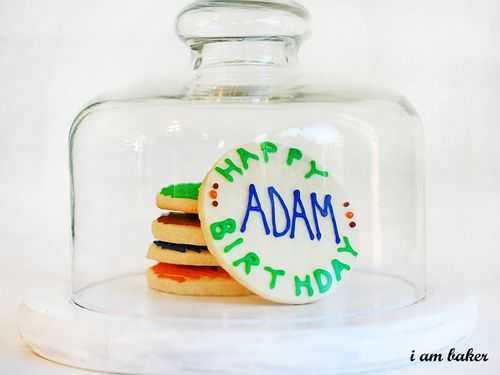 The only thing I knew about the recipient was that he was turning 30 and his name was Adam. So. I tried to go for masculine. Hence, the brown, blue, and green. I'm wildly imaginative you know. I think I ate these. Its all kind of a sugar induced mental blur. I used my favorite sugar cookie recipe and glaze icing. You can see a tutorial (and see how much I spent!) over at my other blog, i am mommy. Oh my! Am I the queen of transitions today or what?!? Speaking of my other blog, I just have to share a little gift I received. 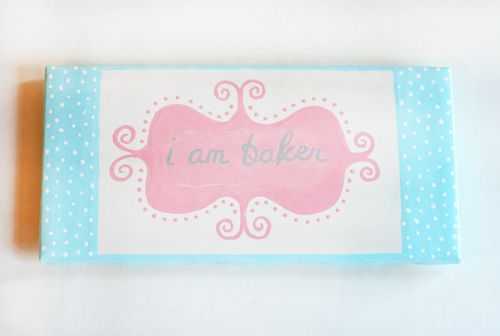 The amazingly talented Renee of Kudos Kitchen made these personalized painted tiles for me. It matches my header perfectly!!! And it has magnets on the back, so now hangs in a prominent spot on my fridge. And she also sent and extra special treat… a tile for this blog! She is truly gifted. And she can paint ANYTHING!!! If you have any questions or want to see more, just email her at [email protected] or stop by her blog. okay, so maybe they’re not WILDLY imaginative, but who’s to say wild designs are best? they’re perfectly-done and pretty (and delicious, no doubt)–that’s all that matters! 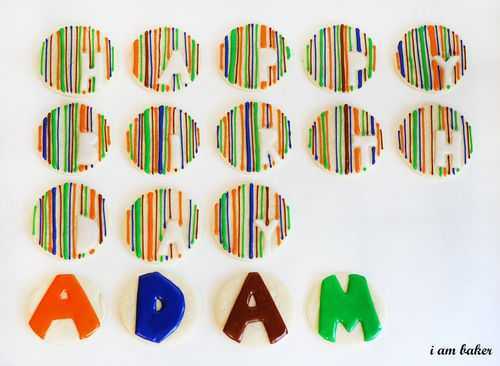 those cookies are beautiful, I love how you did the stripes and the letters….I am just happy most days to get anything I bake out of the oven on time! 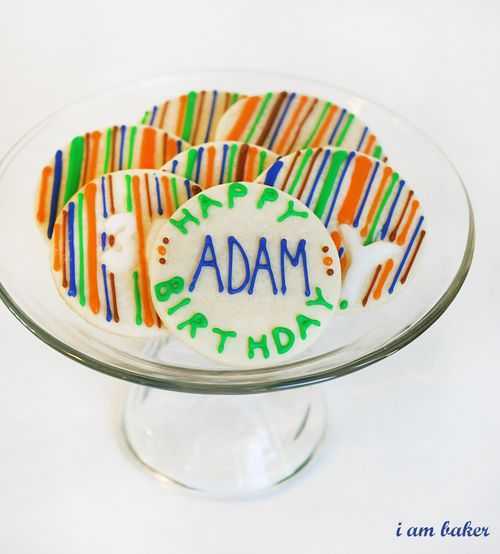 these birthday cookies are just the cutest things ever! i absolutely LOVE them! you are incredible with what you create, i swear! I LOVE these cookies! So creative! 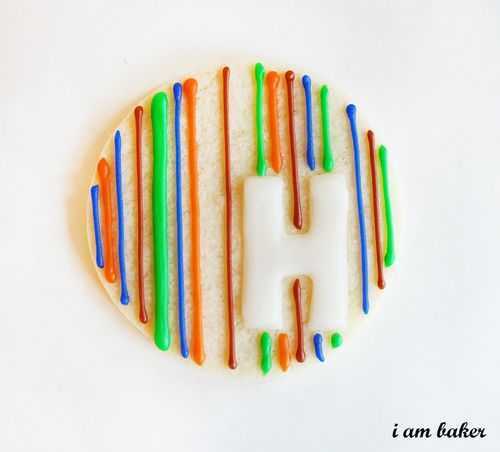 I’ve probably been baking for 62 years (I’m now 66) and still cannot put a straight line on a cookie. Do you just do it freehand or use some kind of guide? Any advice would be appreciated, though I realize artistic ability is critical. I think I was absent the day God handed out artistic ability. Thanks for sharing.